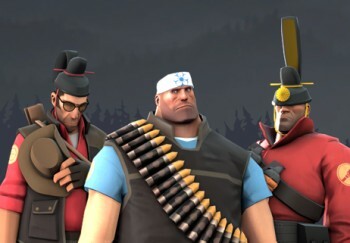 Valve's Team Fortress 2 "Hats For Japan" relief effort is a huge success, raising $300,000 from the community so far. Valve unveiled a very cool program to raise funds for disaster relief efforts in Japan last week: a series of three unique, expensive Team Fortress 2 hats, available for two weeks only, that cannot be traded. In other words, the only way to get one is to pony up a few bucks for Japan and that's exactly what TF2 gamers are doing, in a big way. "Wow. Seriously, people, WOW. We knew you had it in you, but we're still amazed you've raised over $300,000 so far," the TF2 Team wrote on the Team Fortress blog. "Take a BOW, TF2 community -- because that is an incredible, frankly astounding, amount of money from a dedicated number of gamers, to one heck of a lot of people in some real need right now. Anytime someone gives you guff about something negative in gaming, you go ahead and point them to this post, because here's some late-breaking damn news: they are wrong and gamers are generous and awesome." The three hats - the "Humanitarian Hackimaki" for $7.99, the "Benefactor's Kanmuri" for $19.99 and the "Magnanimous Monarch" for $99.99 - will be on sale until April 6 so there's still plenty of time to pick one up if you haven't already made the move. Good hat, great cause - what more could you ask for?